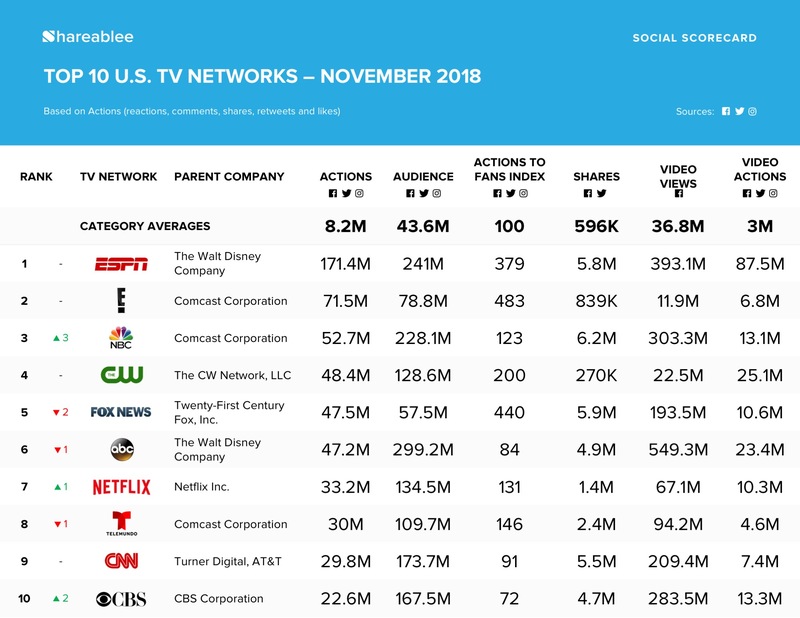 NEW YORK, December 7, 2018	(Newswire.com) - Shareablee Inc., the global leader in audience-based social media measurement, today released their ranking of the most socially engaged American TV networks for November 2018. 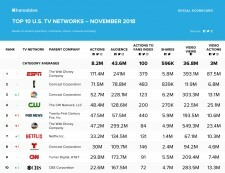 The ranking includes all television shows and all main network brand accounts under their respective networks, which were down 2.1 percent overall and reflected a total of 802.8 million actions (post-level reactions, shares, comments, retweets, and likes) across Facebook, Twitter, and Instagram in over the last month. Disney’s ESPN earned the top ranking last month with 171.4 million cross-platform actions, while E! ranked second with 71.5 million actions. NBC came in third with 52.7 million actions, followed by The CW (48.4 million actions) and FOX News (47.5 million actions). The top-ranked Primetime TV shows on social media last month were The CW’s Riverdale (31.9 million actions), AMC’s The Walking Dead (14.8 million actions), ABC’s Grey’s Anatomy (6.8 million actions), ABC’s Dancing with the Stars (4.2 million actions), and The CW’s The Flash (3.7 million actions). Freeform’s 25 Days of Christmas partnership with Kohl’s, was the top branded content in November with 301K shares, 144K reactions and 39K comments. ABC Television topped the video rankings with 549.3 million views in November, followed by ESPN with 393.1 million views, and NBC with 303.3 million views. The fastest growing TV networks in November were FYI Network (up 176.5 percent), HBO (up 155.4 percent), Fusion TV (up 139.3 percent), the Discovery Life Channel (up 129.2 percent), and VH1 (up 87.1 percent).